A Peek Behind the Curtain: Comparing 2015 to 2016 – Cheryl Sleboda – Textiles. Technology. Texture. Teacher. I make it no secret that I’m in this business to make a profit. I can’t just jet set off to teach for the fun of it. It has to make me money, so I can pay my bills! During a conversation recently, I had someone ask me about “Where the Money Is” in this business, and I thought I would give you a peek inside, since I’m doing my taxes anyway! My 2016 was a very unusual year. My personal life had a major shift at the beginning of the year, so I tempered my expectations so that I could focus on staying mentally well. My goal over 2015 was a modest one: I wanted to see at least 10% growth. I traveled more in 2016 than 2015, therefore my lecture, workshops, and kit fees were all higher. Technically, sales were not down, but my sales to the distributor level were, which are larger and usually more dollars per order. So, though I increased my personal sales, it was not enough to match the lowered distributor orders. I wrote less for others in 2016 as well, which is why more freelance writing is a goal of mine this year. And commission income, such as affiliate links and other passive income forms have been consistently flat, another area I need to show some growth. So how did I do? Well, I was $300 shy of my 10% growth goal, so not too bad. I have heard from others that their 2016 was down or flat, so I feel I did well by considering my distributor orders were basically non-existent! I also had a rough emotional year, so I also have to factor that in as well. I hope this gives you a little bit of info on how it broke down for me, and I hope it helps you somewhat if you are running your own quilt industry business. 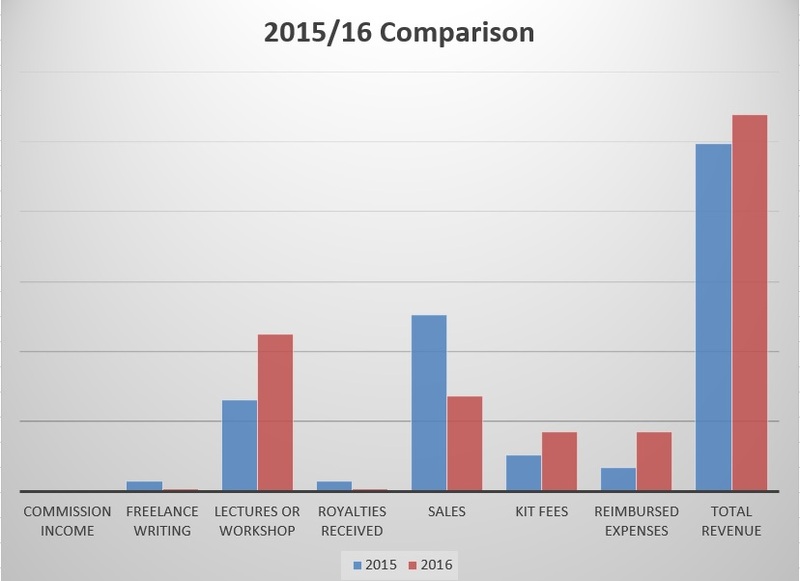 I’ll share the 2016 income and expenses pie charts in another post!